One of the best ways to raise kids who make healthy eating choices is to teach them about where their food comes from. It also includes making a point to bring your child into the kitchen as you prepare meals. While many parents think that children aren’t capable of assisting in the kitchen until late elementary school, in reality, they are ready and willing to help much sooner. Here are some ways you can get your kids in the kitchen, and not just to ask for a snack. Every child has food preferences. By inviting your child to help you choose the week’s menu, you encourage them to think about their food preferences. Once your child has chosen a meal or two for the coming week, ask for their assistance in making a shopping list for ingredients. If possible, they can help you shop for ingredients as well. On the night you will be serving their chosen dish, include them in one of the ways listed below to increase their participation and investment in the family meal. The thought of giving a young child a knife terrifies some parents. If this describes you, a butter knife or a designated child’s knife will work sufficiently without the danger of a very sharp blade. Demonstrate to your child the correct way to hold and handle a knife. There are Youtube videos and other resources that show the best way to chop vegetables. Once you feel confident that your child understands, offer them ingredients to prepare for your family meal. Be prepared for the chopping to be uneven and unpredictable at first. The more they practice, the better they will do. In the meantime, their confidence and feeling of responsibility will soar. 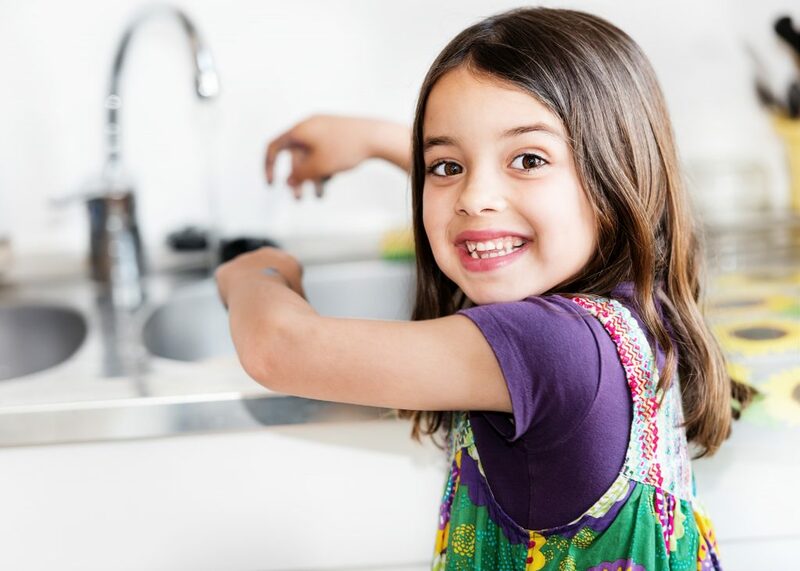 If you aren’t yet ready to give your child a knife, measuring, dumping, and mixing ingredients are perfect kitchen chores for your little one. While handing over this responsibility may make for a messier kitchen, it is a great way to teach mathematical concepts and motor skills. Be sure to watch carefully if your kids in the kitchen are working around anything sharp or hot. Both Publix and Whole Foods offer regular cooking classes and demonstrations. The actual classes, where participants cook, are typically for adults only, but the demonstrations may be fascinating and inspiring for your child. For older children, Sur La Table in Alpharetta is known for their quality cooking instruction. If you can’t manage to make it to a class, there are many fun cooking shows on tv and online streaming. Watch one together and then choose a recipe to try together. If your children are still toddlers or preschoolers, these ideas may seem far out of your reach. However, small children can be helpful and engaged in the kitchen as well. Standing on a chair at the counter, your child can shuck corn, hand you tools and spices, or help you stir a batter. They can also set the table with almost no assistance at all. Surprisingly, many small children love to help do the dishes. The most important part is letting your child know they are welcome by your side in the kitchen. As they grow, they will take on more responsibility and independence. It is tempting to shoo your children out of the kitchen when the real work begins. And it is true that recipes tend to take longer when little hands are helping. But by being involved in the preparation of family meals, children learn that their food choices matter. Kids in the kitchen also learn skills that will benefit them throughout the rest of their lives. If you are looking for childcare that teaches children healthy food choices, consider Legacy Academy Satellite. All our meals are served family style to help children learn independence and healthy choices.